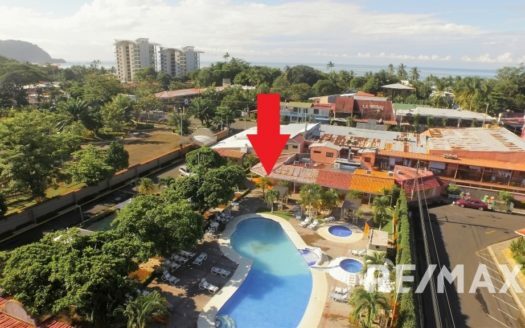 The Jaco Beach condo gated community of Villas Tropical Condominiums is located right in the center of Jaco downtown on Costa Rica’s Central Pacific coast. 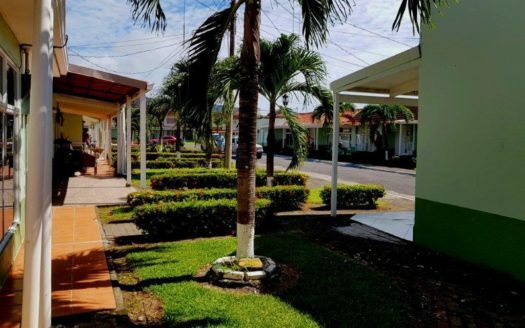 The entrance is just off the main street and just one block from the beach of Jaco so you will always be just steps from enjoying the sand, sun and surf. This is a small neighborhood community with approximately 60l condo units. There are one story or two story condominiums at Villas Tropical. The condos vary in size and have a small living area and a kitchen. 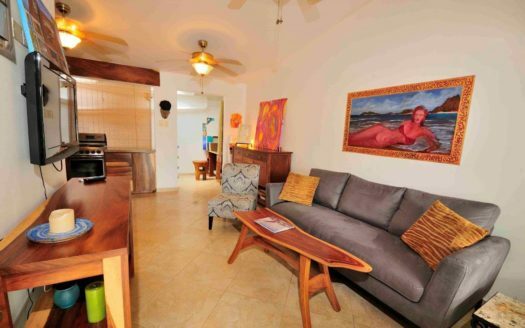 Villas Tropical has 1 bedroom or 2 bedroom units. The condos at Villas Tropical have a front patio. 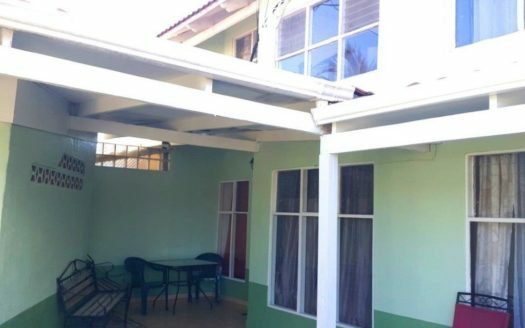 Villas Tropical has the following amenities; 24 hours security and gated entrance, parking, nice size swimming pool and Jacuzzi, kids pool, rancho with plenty of sitting areas and this all in a resort like setting. The gardens and green areas are well maintained. The Villas Tropical community is safe and secure and the monthly maintenance fees are around $128 per month. Villas Tropical is located a short walk to the beach, just one block. The Pacific Ocean provides the beach of Jaco with great waves and surfing is one of the favorite activities of the locals and the tourists. Jaco Beach is a good place to learn how to surf. Another favorite activity is watching the spectacular sunsets in the late afternoons. The beach is the perfect place to see the sun set in the Pacific Ocean. In the town of Jaco you find plenty of restaurants with a choice of fine dining or local food. There are many bars, supermarkets, banks, spas, movie theatre, medical services and much more. Jaco and area offers plenty of activities to choose from such as canopy tours, crocodile tours, atv tours, horseback riding, sport fishing, yoga classes, hiking, golfing and visiting one of Costa Rica’s National Parks. Due to the perfect location and affordability the Villas Tropical condominiums make for a great vacation home or a good rental property. If you are interested in the Villas Tropical condominiums feel free to contact any of our real estate agents at the REMAX Oceanside office.